Focusky is an amazing tool for killer presentations; it helps you to create presentations & animated videos. It opens an innovative world for all your great ideas. Focusky, the best alternative for the PowerPoint, provides the easiest way to create engaging presentation and animated videos. It offers users a series of online templates with different topics: Science & Nature, Business & Finance, Technology, Education, Festival, Infographic, Animals & Pets and more. Users can freely choose one and customize the unique content. Also, users can start with the new empty project or import from PowerPoint. It is convenient to surprise the audiences with the extraordinary visual experience. Focusky provides users different backgrounds for the presentations: 3D background, image background, video background and background color. Believe it or not, it is available to edit the background with shapes and images. The animation editor from Focusky comes for you. It can make your content with amazing dynamic effect. Also, the build-in animated characters can make the presentation extra special and help to impress the audiences with attractive character. Also, you can add voice narration to every presentation slide using the built-in microphone. For the publish options, Focusky allows you to publish to cloud, publish into PDF, publish as Windows Application, video, Web Page, MAC OSX Application, Archive and Mobile Type. For Focusky, nothing is impossible. For a long time, people have been using PowerPoint to create presentations and other visual content that aids presentations. Nowadays, a lot of presentation makers are flooding the market, with the aim of providing an alternative to the PowerPoint point. However, there are only a few of them worthy enough to be said as alternatives to the PowerPoint. Others do not work well, are missing a few features, or are not user friendly. Focusky PRO is a simple and intuitive software application on Mac and PC, which can help you create professional-looking applications for business or school work, without any difficulty. It allows you to design creative and dynamic presentations and then publish them online. The installer size is ~300MB, and might require a fast and stable internet connection to be downloaded. To be able to activate and use the application, you first need to have a FOCUSKY account. You can register a new one or use an existing one. The license key provided here can be easily activated in your account. You can then login with the account on the Mac or PC application. The installation process is simple and straightforward, taking only a few minutes to complete. Once done, and logged in to your account, you can use the application to create professional-looking presentations. The UI of the application has a modern design, and is clean and intuitive. From the left side you can access different tabs like, Recent Projects, Used Templates, and Online Templates, and other different categories. The 4 buttons on the top allow you to start a new project, open an old one, import one from PowerPoint, or open a new one from published files. Moreover, you can search for questions and templates too. The presentation interface is simple and easy to use also, it has a side bar with important functions, and also a navigation bar to zoom, scroll, and move through slides. – Great-looking, clean, and intuitive UI, designed to be suitable for all types of level, with all experience levels. – The application comes with a lot of video tutorials and other help documents, to help you get started with the application. These guide you on how to perform certain tasks with the application. – 3D transition effects such as 3D zooming, panning and rotating effect make your presentation play like a 3D movie. – Multi-language Support, you can install different fonts of your language too. – Add background music to presentations, and control when to play/pause/stop the music. – WordArt & Texture, Various Shapes & Curve, Formula Editor, 1000+ Built-in Animated Characters, 3D Background Templates, Caption and Voice Narration, Built-in Visual Charts and video player, Screen Recording, and many online templates. – Export your projects as HTML, EXE, ZIP, APP, MP4 and PDF formats. – Encrypt your presentations and contents to prevent unauthorized access. – It does lag sometimes, and system resource usage is high too when working on larger projects. Focusky PRO is easily said to be one of the best alternatives to the PowerPoint. It is feature-rich, powerful, and easy to use. The applications run smoothly, with a few lags here and there. It is definitely worth-trying, if you are looking for a presentation tool. Just a bad program all around, just trying to change a background is retarded, then the layout is the pits. No sorry I give this a 1 out of 10. I have to say, it is easy to change the background, no matter the 3D background, image background or video background. It needs a few minutes to load. Cadelson: Have you ever considered that maybe you don’t understand – HOW – to use this program??? Maybe you are just an idiot and you are blaming this software program for your inadequacies!!! First learn – HOW – to use this program, then try writing an updated review!!! DUH!!! There are two main things that are essential for the success of a presentation; good oral presentation skills, and a great presentation software. Focusky Presentation Maker is one such software, designed to help users create captivating online and offline presentations that can be shared on the web and windows applications. Downloading and installing Focusky Presentation Maker is a seamless process and once you are done, you are met with a wide range of video tutorials covering anything you would love to do with the software. It uses Adobe Flash Player and Adobe AIR utilities to run the presentations, so they are installed automatically. Focusky Presentation Maker is one software that will leave novice users happy. The interface is created with the user in mind. Easily add, remove, and modify elements on a page while creating new presentations or choose from the wide range of templates that are carefully categorized. You can import an existing presentation from PowerPoint or start a new project from published files. The software also allows you to access online templates that will create informative and captivating presentations. Unlike other presentation makers, Focusky Presentation Maker allows to design a path that will be followed throughout the entire presentation. You can easily modify, delete, and add paths depending on your requirements. When creating a presentation from scratch, you can effortlessly use the given tools to create and modify presentations any way you’d like. The menu provides basic functions including the access and preview options. When you choose a template, you can edit and modify every section of it to create customized presentations. The software allows you to instantly add shape, texts, and pictures. You can also add animations. 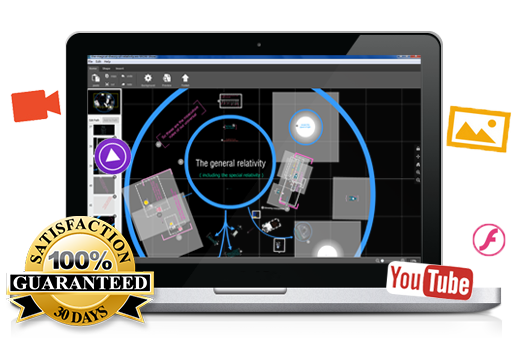 •	Perfect software for novice and professionals with clear video tutorials and guides. •	Graphic elements in Smart Art aren’t grouped together which makes it impossible to remove a Smart Art without deleting all the composed items. •	Focusky Presentation Maker doesn’t spare rich graphics in presentation making and this will come at the expense of the performance of your CPU. However, the effect isn’t that much. Focusky Presentation Maker is a handy tool that will allow you create beautiful high quality presentations that you can effortlessly share on social media and video sharing sites without leaving the application. However, the process involves lots of designing so the quality of your presentation will depend on your design skills and eventually oral skills. Was this written by the Focusky P.R. Department??? It will not recognize my installation and keeps hounding me to upgrade. Sorry . . . uninstalling now.